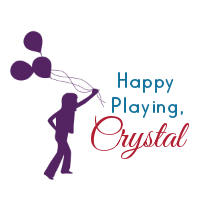 We have been doing some experimenting this week and have come up with some NEW play recipes! This next one I am most excited to share! Many of you are familiar with the glowing water we shared last year. While we love it I have always wished there was an alternative for parents who are uncomfortable using the highlighter water. There have also been many play times we have tried with the highlighter water that have failed. This NEW glow water recipe is a great alternative to using highlighters, and we have already come up with all sorts of ways to play with it that we couldn't with the other glow water recipe. 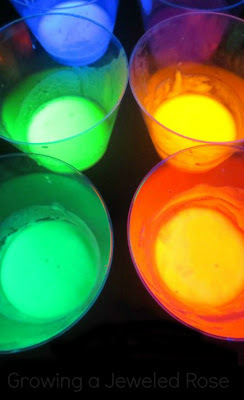 This glowing rainbow water is great for arts, crafts, creating play recipes, and for sensory play. 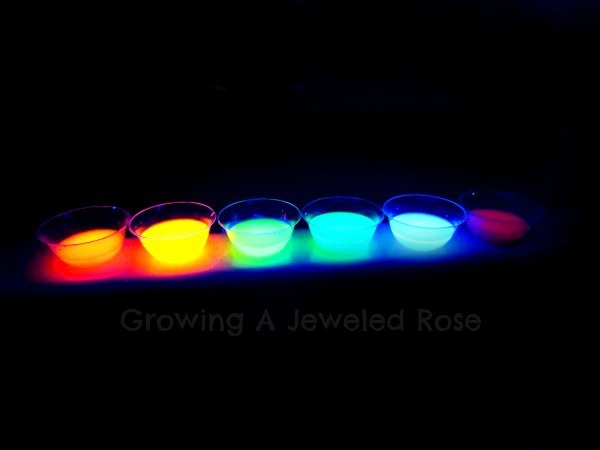 Back when we first played with glow water I had tried to experiment and create a rainbow of glowing water. However, I was only able to create four colors. Now we finally have a glowing rainbow of water to choose from and add to our play! THAT'S IT! The recipe couldn't be more simple. Just add a little glow in the dark or fluorescent paint into very warm or hot water and stir well. Use glow in the dark paint for glow water that glows in the dark. 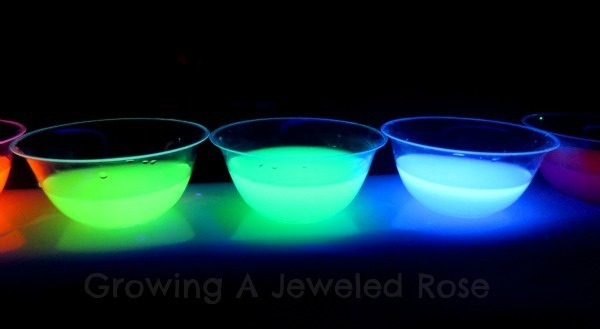 Use fluorescent paint to make glow water that glows under blacklight. Stir until the paint is completely mixed into the water. The warmer the water the faster the paint turns to a liquid and mixes in. The fluorescent paint we use is designed for kids. It is non toxic and meant to be explored and played with by children so it is 100% safe. It is still not meant for ingesting so you don't want to let kids drink it, but this is definitely an alternative that many parents will feel more comfortable with than using highlighters. All of the glowing waters are super vibrant, too! 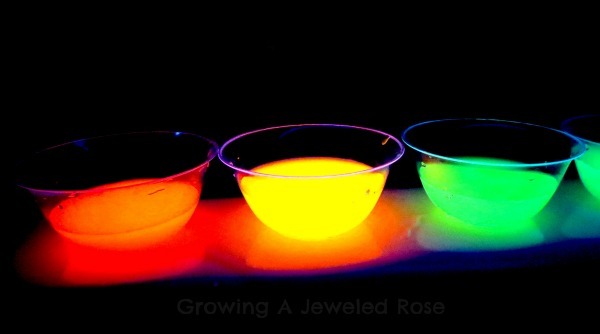 This glowing rainbow water also makes a FANTASTIC glowing water color paint! Use fluorescent paints for UV reactive water. 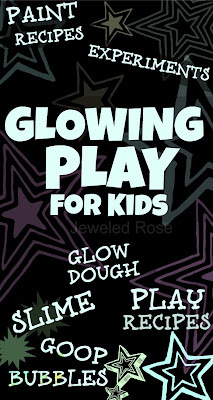 Use glow in the dark paints for water colors paints that glow in the DARK! Way too fun!